On almost a daily basis, residents in New Jersey and elsewhere are considered pedestrians. Whether an individual is walking in a parking lot, traveling by foot on the sidewalk, crossing the street in a crosswalk or walking on the side of the road, he or she is considered a pedestrian no matter how far he or she travels. In most cases, pedestrians are walking in areas where vehicular traffic is present. Because of that, there is always a risk of auto-pedestrian collisions, especially if a motorist is not being attentive or cautious when pedestrians are present, causing personal injury. According to the National Highway Traffic Administration, roughly 5,000 pedestrians die each year in a motor vehicle accident while another 76,000 are injured. 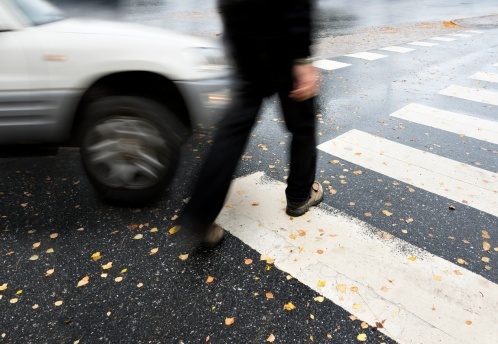 Many pedestrian accidents occur when a driver fails to uphold his or her duty of care. This generally occurs when a driver is negligent or fails to drive safely or follow the rules of the road. Motorists are supposed to exercise reasonable care under the circumstance they are driving in. This means that drivers are not only supposed to follow the rules of the road but to adjust their driving for conditions such as weather or a pedestrian crossing the road up ahead. Common factors that contribute to an auto pedestrian accident include distracted driving, speeding, failure to yield the right of way, disobeying traffic signs or signals, failing to signal a turn and driving under the influence of drugs or alcohol. Additionally, drivers owe a special duty of care to children. Those between the ages of 5 and 9 are at the greatest risk of being involved in a pedestrian accident. Children are small and often unpredictable; therefore, motorists are supposed to exercise extra caution when traveling near schools, parks and residential areas where the presence of pedestrian children is likely. Pedestrian accidents are likely to result in serious injuries because people do not have a hard exterior shell to shield them like an automobile does. Following a pedestrian accident, if a motorist is at fault, an injured pedestrian could hold the driver responsible for the injuries and damages suffered. A personal injury claim could help the victim offset any financial hardship caused by the incident.